Cystitis is widespread among women, especially, women of reproductive age. There is cystitis develops repeatedly among some women. Cystitis – an inflammation of the mucous membrane of the urinary bladder. In the majority of cases, cystitis is caused some infection. Most often it is a representative of the pathogenic flora – E. coli, Staphylococcus, Streptococcus, etc. There are cystitis directly related to sexually transmitted diseases, for example, ureaplasma, mycoplasma. 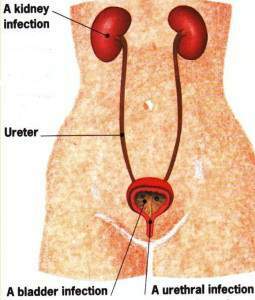 Infection is involved into the bladder of female via the urethra. Cystitis is almost always associated with the violation of the microflora. Usually, acute cystitis is related with freezing. Hypothermia causes a decrease in body resistance, in result, infection actively propagated into the bladder, causing the inflammatory reaction. The heating elements of TEPLON are superimposed on the suprapubic region of the belly. Exposure time is 20-40 minutes. Procedures are carried out 2 times a day. The course of treatment is 10-15 procedures.